Sport has always been an area which has permitted us to teach important values such as teamwork, health, companionship, overcoming obstacles and learning skills. At PROSEC, we and promote physical education across all our projects, which are aimed mainly at children and young people. Through sport, we also try to promote healthy habits such asnutrition, hygiene and drug prevention. We are recognised as a sporting organisationby the Secretary of State for Sport of the regional government of Catalonia. In 2005, one of our initiatives won the Synesis award for the best federated football team at the sports festival put on by Lleida City Council. 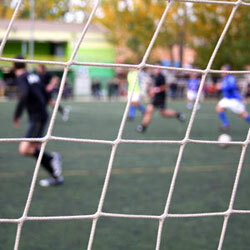 We have various initiatives related to football and futsal. In 2003 three federated teams we created in the Under 11-12s, Under 13-14s and Under 17-18s categories, which participated in their respective leagues for two years. This initiative has led to the creation of a futsal team that participates in non-federated leagues and special championships. This team, in which we ensure gender equity and fair play, is made up mostly of adolescents and young people from the centres we manage. We consider sport and the promotion of healthy habits important elements for those connected with the organisation, whether people we serve or members. It is for this reason that we encourage the participation of employees, volunteers and members sports activities and events. We currently have one football team that participates in charity games and other sports events.